What is a fantasy role-playing adventure without a bunch of fantasy monsters to chase after your players with? 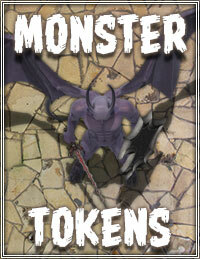 This character token pack brings you a range of monster character tokens depicting some of the most well known and used monsters of the fantasy world. There are Zombies, Skeletons, and Mummy’s for your necromancers horde. The woodland forests are now a little more dangerous with grumpy centaurs and feral werewolves, while your dark cultists are now complemented by the addition of Temple Werewolf guards, and demonic Incubus monsters.